BAGHDAD - Five American troops serving as advisers to Iraqi security police in eastern Baghdad were killed Monday when rockets slammed into the compound where they lived. The deaths were the largest single-day loss of life for American forces in two years. The U.S. military announced the deaths in a brief statement, excluding details. Two Iraqi security officials later said the troops died when three rockets hit near the U.S. forces' living quarters at a joint U.S.-Iraqi base in the Baladiyat neighborhood where American troops were partnering with Ministry of Interior police. The Iraqi officials spoke on condition of anonymity because they were not authorized to speak to reporters. American forces said the incident is under investigation. Names of the dead were withheld pending notification of family. The deaths raised to 4,459 the number of American service members who have died in Iraq, according to an Associated Press count. With the 46,000 U.S. forces still in Iraq scheduled to depart by year's end, American troops and their bases in Baghdad and southern Iraq have increasingly come under attack and threats from Shiite Muslim militias, hoping to construct a narrative that they were responsible for driving out the Americans. At the height of the surge of U.S. forces four years ago to combat sectarian violence that nearly tore Iraq apart, there were about 170,000 American troops in the country. The number then was gradually drawn down to below 50,000 when Washington announced it had ended its combat operations ten months ago. U.S. troops still in the country focus on training and assisting Iraqi security personnel, but are to shun combat. Nevertheless, the American forces still come under almost daily attack by rockets and mortars in their bases and gunfire and roadside bombs when moving around the country. The Baladiyat neighborhood where the five Americans were killed is a predominantly Shiite district near Sadr City, a Shiite slum that was the heart of Muslim sect's opposition to U.S. forces in Iraq. Less than two weeks ago, tens of thousands of supporters of anti-American cleric Muqtada al-Sadr marched through the streets of Sadr City, demanding an end to the American military presence in Iraq. The show of force was accompanied by a threat from al-Sadr himself. During an interview with the BBC he said he would unleash his militia, called the Mahdi Army, on American forces if they do not withdraw. He said his supporters were already targeting U.S. bases and vehicles in Iraq. U.S. officials have been pushing Iraq to decide whether it wants some American forces to remain beyond December 31, and Prime Minister Nouri al-Maliki has said he'll discuss it with the country's main political blocs. But so far there has been no request from the Iraqi side on the extremely sensitive topic. The five fatalities Monday were the largest on a single day since May 11, 2009, when five forces died in a noncombat incident. On April 10, 2009, six U.S. troops died  five in combat in the northern city of Mosul and one north of Baghdad in a noncombat related incident. Elsewhere, a total of 11 people were killed in the northern city of Tikrit, the capital and near the western city of Ramadi Monday. Four of them died when a bomb exploded at a checkpoint outside a government compound in Tikrit, the hometown of Saddam Hussein. It was the second attack in four days against the compound and the government employees who live and work there. The deaths were announced by a media adviser to the provincial governor, Mohammed al-Asi. A military official in the Salahuddin Operations Command, which oversees security operations in the province, said a suicide car bomber blew himself up near the entrance to the compound. It had been a palace and support buildings constructed by Saddam, but now serves as a hub for government offices in the city. Monday morning's attack is the second in Tikrit in recent days. On Friday, a suicide bomber blew himself up in a mosque inside the government compound, killing 16 people. Hours later, another suicide bomber walked into the Tikrit hospital and blew himself up near the emergency room, where family members had gathered. Five people were killed and 16 were injured in that incident. Four others died in Baghdad, where officials said gunmen in speeding cars opened fire on two security checkpoints. The early morning attack took place in the Azamiyah district, a Sunni Muslim enclave, according to military and medical officials. They spoke on condition of anonymity because they were not authorized to talk to the media. 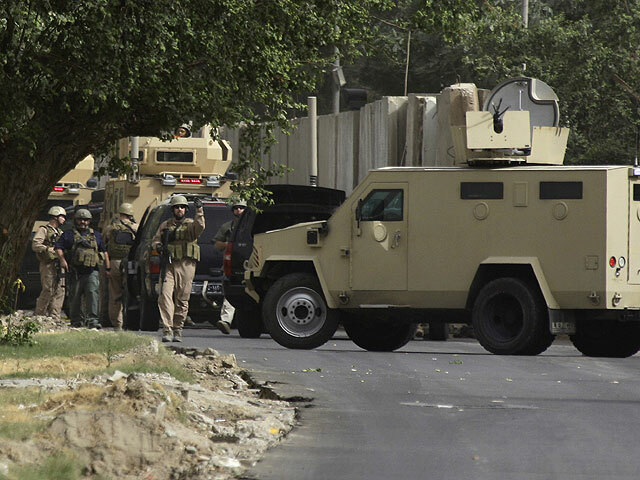 Attackers bombed the house of a police colonel near Ramadi, the capital of the mostly Sunni Anbar province. The colonel survived the attack and was taken to the hospital. His wife, mother and son were all killed, Iraqi police said on condition of anonymity because they were not authorized to speak to the media.